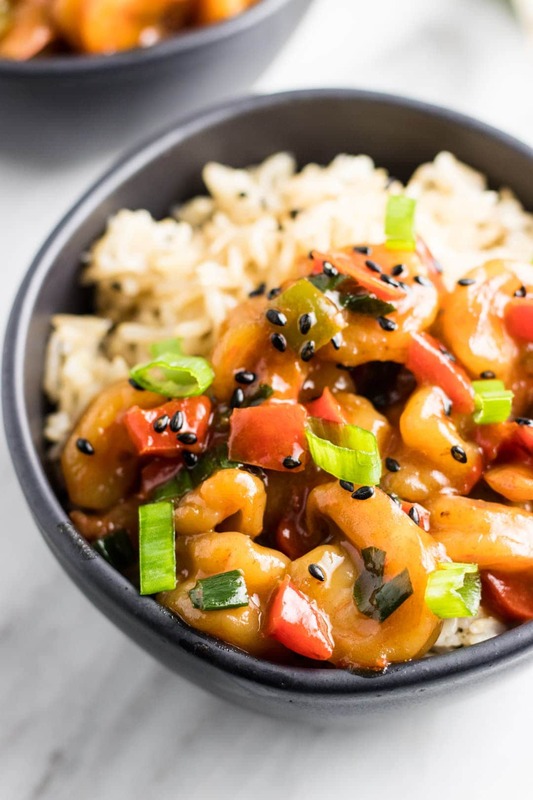 Spice up supper with this easy 20-minute low FODMAP Shrimp Stir Fry with Bell Peppers. It’s quicker than takeout and tastes great – without all of the FODMAPs. 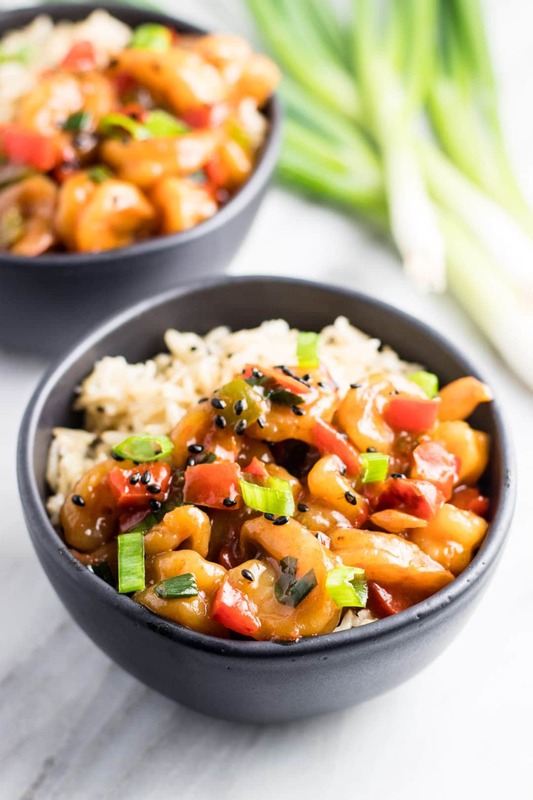 Y’all, it’s Around the World Wednesday and today, we’re having Low FODMAP Shrimp Stir Fry! Woot! Woot! Growing up stir fry was a staple meal on my family’s dinner table and they continue to appear pretty frequently on our menus today. Stir fries can be as simple or as complex as you want to make them. They’re also a great way to use up leftover veggies, lean protein, and even fruit. 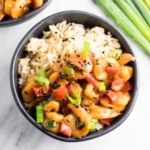 Today’s stir fry features quick-cooking shrimp. For veggies, I’ve chosen to include red bell pepper and a little bit of green bell pepper for color (hey! we eat with our eyes) and flavor contrast. 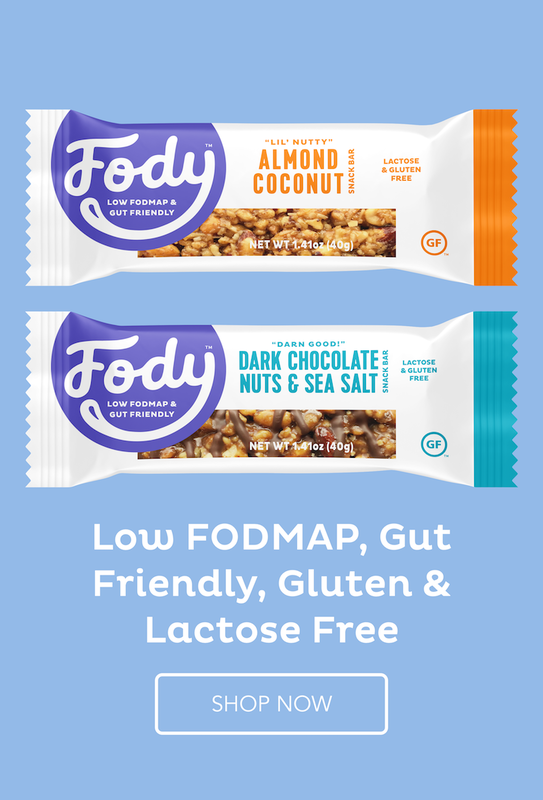 Feel free to sub in other FODMAP-friendly veggies if you’ d like. Let’s chat mise en place. If you’re not familiar with the concept, mise en place is a French phrase meaning “everything in place”. In the culinary world, this means getting all of the ingredients ready for a recipe before you even start cooking. This might mean chopping green onion tops or cooking rice ahead of time. It can be a really helpful concept to ensure you have everything you need in the correct measurements and help the cooking process go smoothly. When I do get mise en place, everything does go a lot more smoothly. 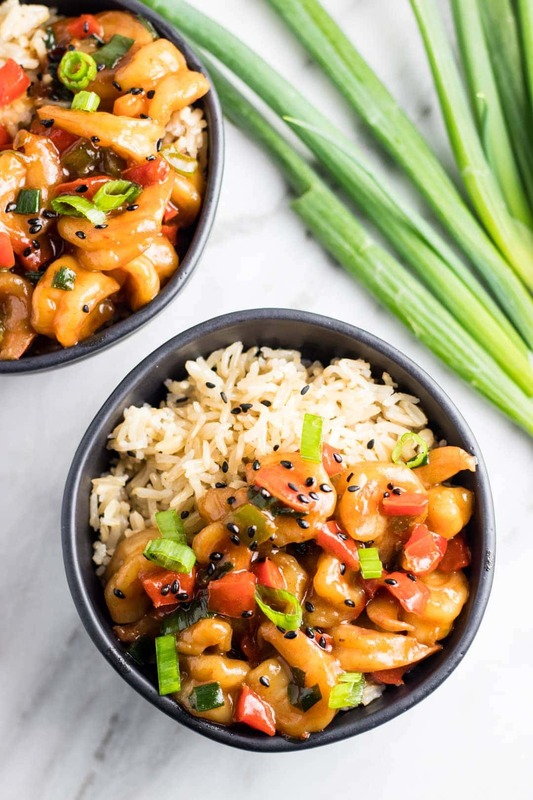 And, it can be especially helpful when you have quick-cooking dishes like this stir fry recipe, where there isn’t a lot of time to prep ingredients as you cook. I tend to enjoy my food on the spicier side of the spectrum. So, I’ve included a couple of jalapeños (or other hot peppers) in this recipe. Feel free to decrease, increase, or omit, based on your taste preferences. When I cook with hot peppers, I like to slice the peppers partially in half lengthwise leaving the stem part intact. This adds heat to whatever dish I’m cooking, but requires less cutting (and less opportunity for me to accidentally touch my eyes after). 😉 I’ll then remove the peppers right before serving. FODMAP Note: Red and green chilies are low FODMAP. 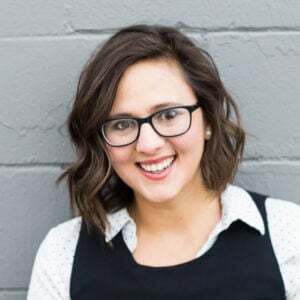 However, some people find that capsaicin, a non-FODMAP but naturally-occurring compound found in peppers, doesn’t jive with their digestive tract. So, if you experience indigestion or IBS-type symptoms after eating, you might want to dial back on the peppers. 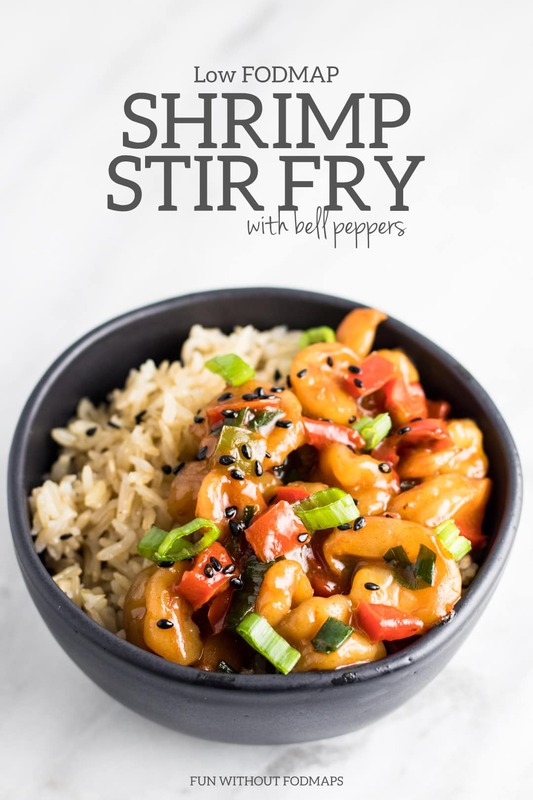 Spice up supper with this easy low FODMAP Shrimp Stir Fry with Bell Peppers. It’s quicker than takeout and tastes great – without all of the FODMAPs. In a small bowl, whisk together tamari, garlic-infused olive oil, rice vinegar, cornstarch mixture, and brown sugar. Set aside. Heat 2 tsp. cooking oil in a large frying pan over medium-high heat. Add peppers and chiles and cook until bell peppers are just fork-tender. Add remaining 1 tsp. cooking oil and shrimp. Cook, stirring occasionally, until shrimp are almost completely cooked. Stir in green onions (green parts only) and sauce. Bring mixture to a boil and simmer until sauce has thickened (it happens pretty quick!) and shrimp are completely cooked. Remove chilies. Stir sesame oil into the mixture. Serve warm stirfry over rice with optional garnishes. Green Pepper: A low FODMAP serving is a ¼ of a medium pepper or 75 grams. Chilies: Reduce or omit chilies for less spice. Chilies are low FODMAP, however, they do contain capsaicin. Capsaicin can be a non-FODMAP trigger for some with IBS. Sesame Seeds: Considered low FODMAP in servings up to 1 Tbsp. or 11 grams.